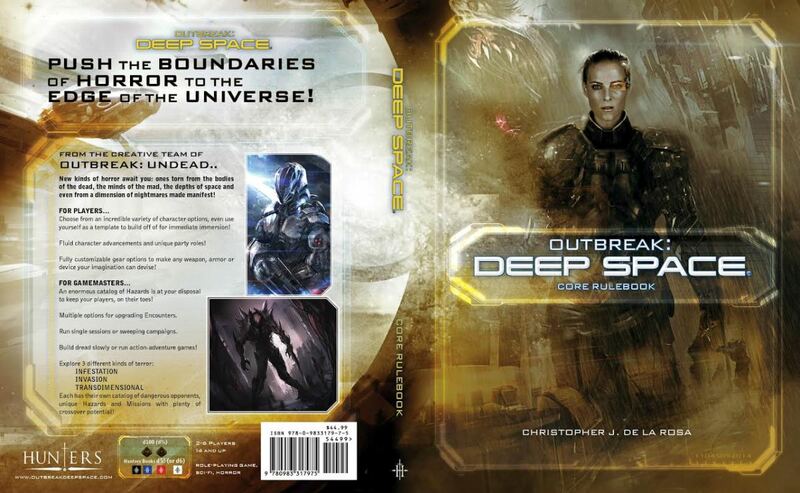 Outbreak: Deep Space is a complete military sci-fi survival horror role-playing game, written by Christopher De La Rosa, Robert Watts, and Ivan Van Norman and published by Hunters Books. Most tabletop role-playing games can be classified in two different ways: a setting designed to fit with a set of mechanics or a set of mechanics designed to fit a setting. Yes there is some gray area between those two, but generally games fall into one of those two classifications. Outbreak: Deep Space is by far a game where the mechanics were designed around the setting. 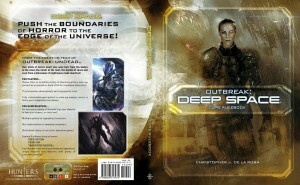 Outbreak: Deep Space is a military sci-fi survival horror game. It’s kind of a mouthful, but it’s quite important to understand each one of those aspects, although not necessarily in that order. For starters, the setting and system are science fiction; seemingly far into the future. This means you get all that cool sci-fi equipment: armor, weapons, and gadgets. Second, it’s military; this means the game revolves around a lot of action without the drama, intrigue, and politics like space opera. Third, it’s horror; there are no shortage of scaring things to deal with on a regular basis. Finally, it’s survival horror; the goal is to survive because the horrors you’re facing are so bad that you may not make it to the end. Gear in Outbreak: Deep Space is quite dynamic. Gear is primarily supported by equipment kits, because a character should be completely outfitted to do the job they need to do. These kits can be further customized through external modifications and tech point upgrades. This is a very important mechanic to support that military sci-fi feel. It’s reminiscent of what a soldier in any army would be given so that they can be of value to their unit and do the job they’re supposed to do. The effects of horror are numerous. You don’t just have one measurement of how horror effects a character, you have several: morale, insanity, psychological trauma, psychosis, therapy, regression, mental trauma, and other little bits here and there. This doesn’t just support horror, this is truly survival horror as it reminds you that there are many ways horror can affect a character and how many different ways a human might respond to that. The overall level of horror is measured by an outbreak level. Granted, this is part of the Outbreak series, but this is one of the underlying mechanics, or at least it seems to be, that really defines survival horror as opposed to investigative or action horror. As the story progresses, the atmosphere worsens and things begin to happen more often. Maybe encounters are more frequent; maybe encounters are more deadly; maybe things just start feeling wrong. I would like to note that Outbreak: Deep Space is not a game for beginners. However, I’d also like to point out that most beginners don’t start with survival horror as they may not be able to handle character death. (“This is the first time I’ve ever played and my character already died? !”) So, don’t approach this RPG with the idea that you’re going to be handled with kid gloves and walked through it like an introductory game. It pretty much has the assumption that you’ve played RPGs before and are ready to truly embrace the world of military sci-fi survival horror in all of its aspects. If you’re prepared for that type of atmosphere, than this is a game that will fit like a glove!